"We're not going home. We're staying here. I want us to live in Iran." Once one gets past the absurdly melodramatic movie-of-the-week style title, there's a not half bad picture here. It does feature a strong central female character, facing nearly impossible odds, with heavy helpings of utter brutality and depravity fueled by religious mania. 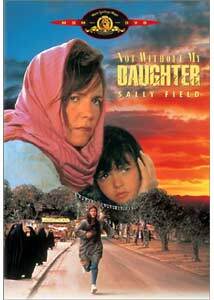 Based on a true story, the picture features the family of all-American girl Betty Mahmoody (Sally Field), her Iranian-born doctor husband Moody (Alfred Molina), and young daughter Mahtob (Sheila Rosenthal). Despite the fact that Iran of 1984 is a hotbed of Islamic anti-American hatred, Moody convinces Betty to come with him to visit his family in Teheran for two weeks. What he doesn't reveal, however, is his intention to remain there, for good, and enslave her as a proper Moslem wife. When she objects and tries to leave, she is beaten violently and made a virtual prisoner. Upon contacting the Swiss embassy to get help, she's informed that even if Betty could escape, Mahtob is still the property of her father under Iranian law. Betty then desperately tries to make her way to freedom, with Mahtob in tow. Although not particularly accomplished cinematically, there are a number of very effective sequences. One of the best of these is Betty being greeted at the airport by the family with a black chador that she is forced to wear, despite Moody's repeated assurances that she would not be so required. Several hairs pop out of the chador on the way home, and they are stopped for violating Islamic law by a carload of men with automatic weapons. When she does not properly fit into the mold of the quiet, obedient wife, the entire extended family screams at her incomprehensibly in a riveting and nightmarish sequence. There's a fair amount of Stockholm Syndrome in evidence as well; at one point Betty becomes briefly reconciled to the idea of making a life in Iran and falls back in love with her husband; she also meets Ellen, a woman from Chicago who has adjusted and made herself content, despite vicious bloodyings by her husband. Sally Field does a very good job, believably conveying a wide array of emotions and steely determination. Her interaction with her daughter in particular is a high point of the picture, although the child doesn't help her much. Rosenthal is pretty much called upon to look cute or cry and there's not much else to judge her by. Although the featurette speaks about Molina trying to make Moody a synpathetic character, that doesn't come across at all, except in a heavyhanded scene of doctors in America being racist towards him and engineering his dismissal. However, he doesn't display an ounce of humanity other than being self-centered and fanatical. He does have a great line about how Mahtob can learn real values in Iran, while he is simultaneously beating his wife mercilessly. Ow, there goes the ironymeter. During the climactic escape sequence, there are moments where it's difficult to determine what's happening; threats appear and then seem to vanish inexplicably. While this was at first frustrating, it does nicely convey Betty's own confusion at what was happening and virtual uncertainty as to whether she was escaping or being captured. Part of this disorientation is supported by the frequent scenes played entirely in Farsi, without subtitles. Like Betty, we feel excluded from what's happening, and this increases the sympathetic feeling of helplessness. Although one doesn't necessarily have a great deal of sympathy for Betty in getting herself into this situation, her fortitude and bravery definitely make one sympathetic as she struggles to make her way out, but not without her daughter. Image Transfer Review: The widescreen anamorphic picture is generally pretty good. Much of the film is shot in quite soft focus, apparently in an attempt to make Field look younger. Clarity thus suffers a bit. Colors are rather subdued, but black levels are decent. No artifacting was visible. Audio Transfer Review: The Dolby Surround audio track is quite effective. While center-oriented much of the time, one hears chanting from the muezzin from the surrounds through much of the picture. Directionality is used effectively during a rainstorm and a windstorm; a sequence of Teheran being bombed during the Iran-Iraq war is also noteworthy. Some scenes evidence a minor hiss, but the dialogue is generally clear and Jerry Goldsmith's score is undistorted. While the trailer contains heavy bass, there is little present during the film itself. Extras Review: The principal extra is a studio fluff piece Making-of featurette (06m:12s). This features a fair amount of interesting behind-the-scenes footage, however. An anamorphic 1.85:1 trailer is included as well, but that's it for extras. Welcome to the Iran of the Ayatollah Khomeini, where women are less than dogs. Sally Field carries the day with determination and a powerful performance. Not much for extras, but a nice transfer, so definitely worth a rental.